Updated on September 4, 2016 by Regev Elya. That’s how much time I spent reading, taking notes, comparing, analyzing and researching different web hosting companies. I was obsessed. You see, now that I make 100% of my income online, choosing the best web hosting for my WordPress sites is one of my most crucial decisions. Any server downtime or slowness can result in a serious loss of income. So, Regev, What Is The Best Web Hosting Service? Faster loading times. Less site abandonment. Higher Google Rankings. Higher Conversion rates. Higher revenue. In the online world we’re living in today, website visitors have very short attention spans. Phil Dixon from Shopzilla showed that speeding up his site’s loading time from 7 to 2 seconds resulted in a 25% increase in page views and a 7-12% increase in revenue, all with a 50% reduction in operating costs. That is a drastic improvement. According to a study made by Akamai in 2009, 40% of visitors leave a page if it takes more than three seconds to load. Forty percent! They also found out that every one extra second can result in a 7% decrease in sales. Because of all that, Google has recently started incorporating page speed markers into their search engine algorithm. All else being equal, the faster your site is — the higher it’s gonna rank. Higher rankings mean more visitors, and more visitors mean higher revenue. My point is, you can no longer afford not to have the fastest web hosting for your website. You can no longer afford to offer a slow browsing experience. Site speed has a significant impact on both your rankings and conversion rates, and you literally lose money by not upgrading to a rock-solid, fast web host. And InMotion Hosting is… blazing fast. According to WPSiteCare, InMotion scored the best loading times, with a maximum of 836.78ms and a minimum of 478.42ms. In comparison, BlueHost and HostGator (both belong to EIG group) scored more than 10 seconds (!!!) on the maximum response time. InMotion max load time was less than a second. InMotion stayed right around 600ms for the entire test, which is really impressive … The variance from highest response time to lowest response time is roughly 388ms, which is the best in the group. In WPSiteCare’s test, InMotion was the fastest web hosting, beating SiteGround, BlueHost, A2 Hosting, Site5, MediaTemple, Dreamhost, Eleven2, GreenGeeks, Arvixe, Hostgator, and GoDaddy. Some of the differences were dramatic, even when compared to MediaTemple, a hosting solution that costs more than twice. Also, InMotion offers something called Max Speed Zone™, allowing you to pick the datacenter closest in proximity to the majority of your visitors. If your readers are nearby the Max Speed Zone, your website can load up to 6 times faster to them. Zero downtime. Incredible Support. Backups. Better sleep. As someone who travels the world most of the year, I want to have the freedom to enjoy my journeys without having to worry about whether my websites are up or down. I want to be a 100% sure my sites are always online, making money and funding my travels when I’m out there without an internet connection. 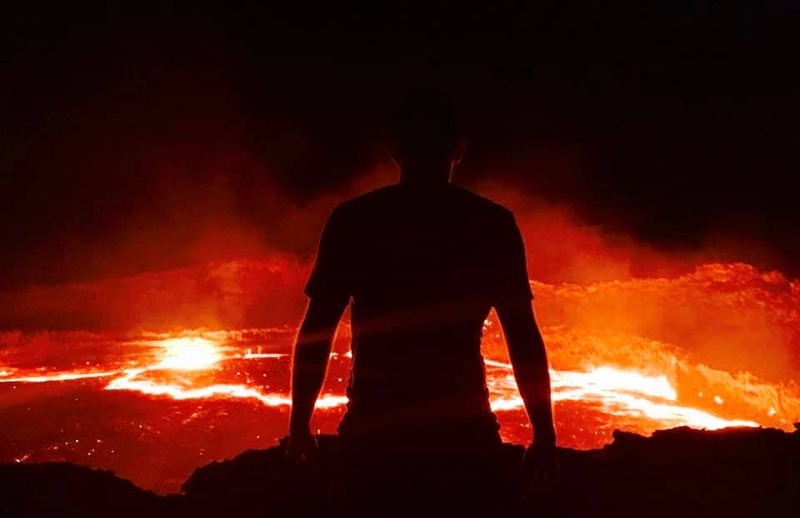 I just returned from Erta Ale volcano in Ethiopia. Spent a couple weeks there in Africa without ever having to worry for my sites being down. That, my friends, is what I call freedom. InMotion is an American company, with American employees all too ready to live-chat (or answer emails/phone calls) with you 24/7. Customer service is really important for me, because I want to have someone I can immediately talk to if something unexpected happens. With my previous hosting provider, my sites could go down for half a day before someone answered. But not so with InMotion. For example, I was trying to manually install an SSL certificate on RegevElya.co.il (an Hebrew site of mine) and messed things up. Went on the live support chat and they fixed this in a matter of minutes. I’m not talking about support only. There’s also the issue of uptime. You see, not all web hosts are capable of handling peak traffic when you hit a really popular day. Actually, the main reason I changed hosting was because my previous provider (HawkHost) crashed a couple of times a month, for a total of a few hours. Not only could those crashes mean a few hundred dollars of lost sales a month, but they could also mean a loss in Google rankings in case the search engine robots visited at the downtimes. So yeah, it was a no-brainer to upgrade and pay more. So far, my experience with InMotion hosting has been entirely different. I’ve had 100% uptime. Overall, when I consider the helpful and responsive US-based support, the great hardware that keeps my sites constantly up, together with their free data backups (most web hosts charge for it), I can easily see why InMotion’s A+ BBB (Better Business Bureau) rating is well deserved. InMotion is not the cheapest of shared hosting, but we’re only talking about a dollar or two extra a month compared to cheaper web hosts. But trust me on this, whenever the hosting price is very low, unresponsive support, sluggish speed and very poor uptime are issues to be dealt with. Some dodgy hosting companies even place ads on your website without your permission! I personally pay for InMotion’s Shared Business Pro (I have about a dozen sites hosted, so I can’t use the cheaper options). If all you need is one or two sites, I recommend the Launch plan. If you need three to six, use the Power plan. If you need more, use the Pro plan. See all the plans here. Is InMotion also the best VPS hosting service? I’m still using their shared (“business”) hosting! This cheap hosting literally holds my website on 100% uptime, lightning-fast… on more than 4,000 page views a day! I will probably move to a VPS in the near future, but I’m astonished of their shared servers’ capabilities. By far, and without a glimpse of hesitation, InMotion is the best web hosting provider I’ve ever used. Will they transfer all my sites for free? Yes. They handled moving all my sites from HawkHast, with no issues and at no additional cost. What about a CDN? Can MaxCDN or CloudFlare make my sites even faster? To speed your site even further, people say a CDN (Content Delivery Network) is a rock star. But I don’t like to act blindly, so I tested it. I went on both Pingdom Website Speed Test and WebPageTest.org and tested a heavy page from my site (hosted in InMotion) loaded a couple times without a CDN, a couple times with MaxCDN, and a couple times with CloudFlare CDN. The results really took me by surprise: There was absolutely zero difference in loading speeds. Either MaxCDN/CloudFlare are overrated (and yes, I’m 100% I configured them properly. I used Yoast’s guide), or InMotion is just so blazing-fast that a CDN makes no difference. Worthy of mention: W3 Total Cache plugin (which I highly recommend) was installed at all times. Why not a Managed WordPress Hosting? It does comes with a price, and I think the benefits definitely aren’t it for people looking for a shared host, especially for people who keep an eye out for plugin and WordPress updates and always keep their sites up-to-date. When I’ll move to a VPS, it’s probably going to be Synthesis, which is a managed WP hosting. The reason isn’t so much that it’s managed, but because Synthesis belongs to the creators of StudioPress’s Genesis Framework, which I’m using for my sites. No other hosting is as tailored specifically to Genesis as Synthesis. But it costs a whopping $100 a month for one site. For the vast majority of websites, InMotion shared hosting is a perfect, affordable solution. Is it true that some plugins won’t work because of hosting issues? Yes, but that’s usually a problem of cheap web hosts that can’t dedicate enough memory and hardware resources to handle heavy plugins. I have never encountered this with InMotion. Is InMotion the best web hosting even if I cater to an international audience? I was worried about it too at first, because my previous web host’s datacenter was located in Amsterdam (Netherlands) while InMotion is located in the U.S (You can choose West Coast or East Coast). My audience is global, and I also have sites aimed for Israelis, which are much closer to the Netherlands than to America. But I still took the chance, and the pages load quickly anyway. Verdict: Is InMotion The Best WordPress Hosting? Whether your’e going to build a WordPress blog to make money online or a fancy new website for your business, I highly, highly recommend hosting your site(s) on InMotion Hosting. They’ve been a reliable part of my business so far, and I love them. If it sounds like I’m enthusiastic, it’s because I am. I went through hell with hosting providers, and spent a year comparing them all,until I finally found what my business deserves. But don’t believe me. Go and try them yourself. They offer a three-month full refund period, so you’re safe. Send me a love letter and a box of chocolates later. Note: If you’re reading this, it means that InMotion is still the best web hosting service that I have ever used. And it also means that my websites are still hosted there. If and when I change my web host in the future, updating this post will be the first thing I’ll do.